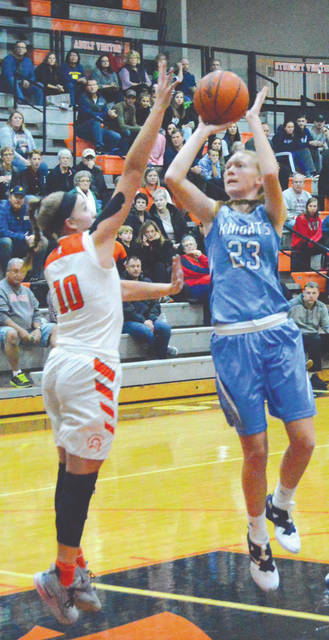 Legacy Christian’s Emma Hess (23) puts up a shot over Waynesville’s Leah Butterbaugh in the first half of Saturday’s Nov. 24 girls high school basketball game at Waynesville High. Emily Riddle of Legacy Christian drives in for a layup score Nov. 24 in a girls high school basketball game at Waynesville High School. 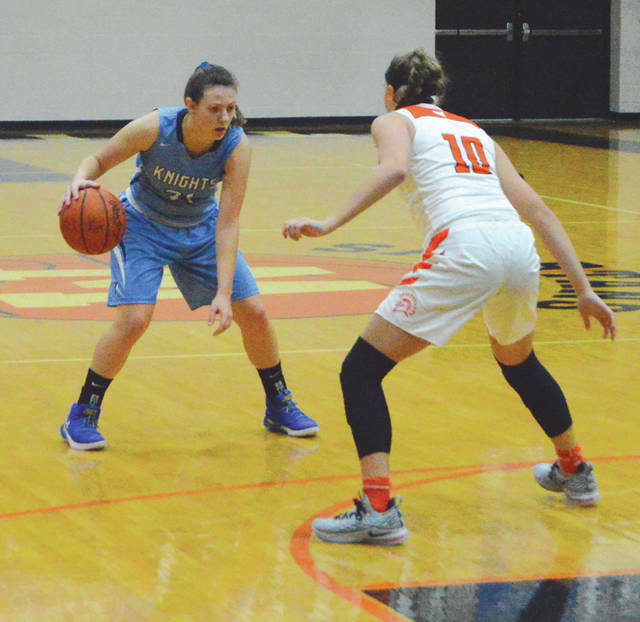 Knights point guard Kathleen Ahner (21) scored all 10 of her points in the first half of Saturday’s Nov. 24 loss at Waynesville High. Waynesville’s Kenzie Purkey (15) comes up with a loose ball and passes to teammate Lynzie Hartshorn (25) during the first half of Saturday’s Nov. 24 girls high school basketball game with Legacy Christian. 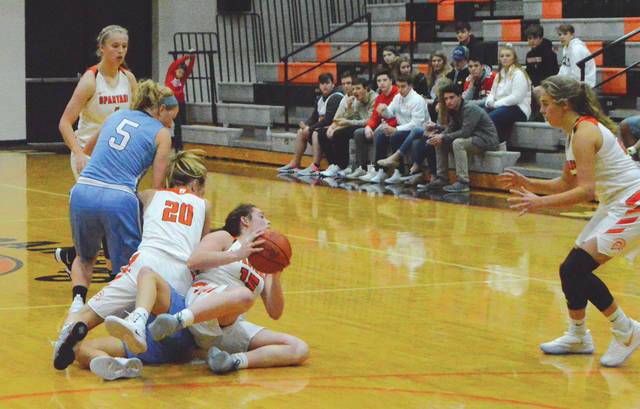 WAYNESVILLE — The physical and mental rush of winning on Friday may have caught up to the Legacy Christian Academy Knights on Saturday. 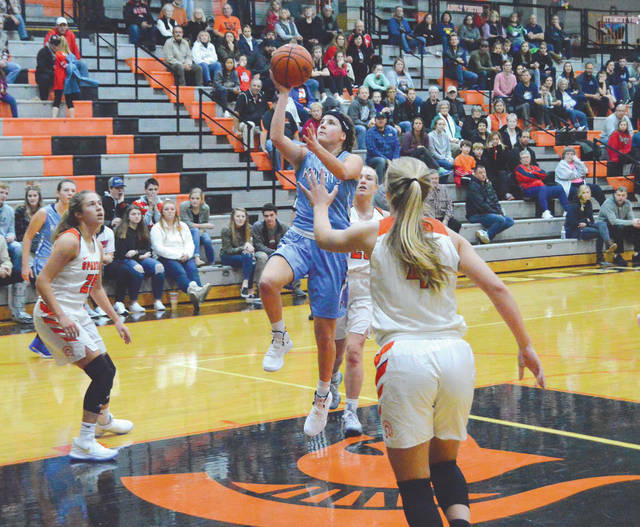 LCA defeated Columbus Bishop Hartley, 54-41, on Nov. 23, the first day of a two-day girls high school basketball opener at Waynesville High, but the Knights may have run out of gas in a 62-38 loss to host Waynesville the following day. After leading 22-18 at the break, Legacy Christian just couldn’t score in the second half. Meanwhile, Waynesville ripped off a 19-0 scoring binge to suddenly be in front 39-22. The weary Knights were outscored 28-4 in the third quarter. The Knights were without the services of senior Danielle Mathews who sat out with an undisclosed injury. Legacy coach Mark Combs said depth could’ve been a factor, especially after having just played a game the night before. Three-time Southwestern Buckeye League Player of the Year Rachel Murray had scored four points in limited duty in the first half, but then exploded for 19 in the second, for a game-high 23 points and sophomore point guard Leah Butterbaugh finished with 11 points to lead the Spartans. Waynesville earned an extra day off as well, when Belmont High inexplicably did not show up for its game with the Spartans on Friday’s opening day of the four-team tournament. “It was just a matter of our getting our timing down and pushing the ball up the floor,” said Waynesville coach Tim Gabbard. “Rachel sat out a lot of the first half, so after she came back in we got a little bit more of a rhythm going, and started to hit some shots. Sizer snared 15 rebounds and had three steals in the win. Legacy’s Kathleen Ahner led the Knights with 10 first-half points, but was held scoreless the rest of the way. Teammates Emily Riddle and Emma Hess were limited to a combined nine points in the first half, and both finished with 12 points each for the game. The Knights (1-1) travel to Dayton to take on Chaminade Julienne for a 4:30 p.m. contest on Tuesday, Nov. 27 next. LCA will get into Metro Buckeye Conference play next week when they will host Middletown Christian on Monday, Dec. 3.